The Campaign for Prison Phone Justice responds to a court stay on the FCC's sweeping reforms. Some ancillary fees will eliminated on March 17, 2016 when the new rules take effect, but families of those incarcerated will have to wait to see if lower rates will be adopted. A new report on electronic monitoring by James Kilgore discusses this technology in the context of police surveillance and the ever-expanding mass incarceration system in the United States. We submitted our findings on the growing trend of video visitations in jails and prisons throughout Illinois. We found that several counties have eliminated face-to-face visits after installing video visitation, which we believe seriously threatens the ability of families to stay connected to loved ones incarcerated. For ten years, Champaign County has provided inexpensive and efficient phone services at a small-sized jail with NO commissions. This contradicts the National Sheriffs' Association which argues that small jails have more costly phone services. The below letter was submitted to the FCC which will soon rule on whether to eliminate all commissions. Illinois now has the highest commissions in the country, with $12 million collected by the Illinois Department of Corrections each year from families with loved ones incarcerated. Illinois stands as a leader in the nation for its expensive prison phone rates. In 2012, the Illinois Department of Corrections (IDOC) took in an astronomical $12 million in “site commissions,” or “kickbacks,” among the highest of any state in the country.The high costs are largely due to a virtual monopoly by Securus Technologies, which has the contract for the IDOC. Securus also operates phone services in nearly 80 percent of Illinois county jails and all prisons. 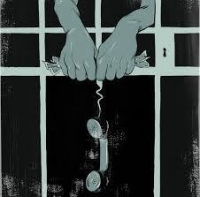 We call on the FCC to make affordable phone calls from prisons and jails. In a welcome bipartisan move, a bill helping those incarcerated stay in contact with loved ones passed the Senate with a unanimous vote and is expected to pass the House on concurrence with a strong bipartisan vote. A bill signed into law today cuts in half the cost of phone calls from Illinois prisons.